Indiana University inducted new members to its Presidents Circle during a special ceremony held October 19 in Bloomington. This year’s inductees include Indiana University East Chancellor Kathy Cruz-Uribe and Eugene Cruz-Uribe; retired senior lecture of anthropology Rob Tolley and his wife, Nancy; and Jane and Wayne Vincent. First Bank Richmond is celebrating IU Day with a $10,000 matching gift opportunity for alumni and friends of the campus. First Bank Richmond will match – up to $500 per donor – up to $10,000 in total giving to the IU East campus today. Terry Wiesehan has a deep affinity for Indiana University East. 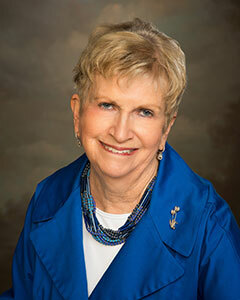 In recognition of the university’s impact in her life as an alumnae, as well as the current director of Alumni Relations and Campus Events, Wiesehan has made a $133,000 gift to IU East. 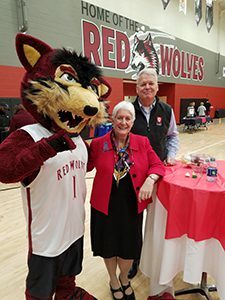 Indiana University East announced a $375,000 gift from First Bank Richmond during the Chancellor’s Medallion held tonight (November 3) at the Student Events and Activities Center on the IU East campus. David and Marilyn Fulton, Charlie and Jeanetta Nelms, and Bill and Felicia Quigg are among the newest inductees to the Indiana University Presidents Circle. They were recognized for their philanthropy, strong support and dedication to Indiana University East and IU during a ceremony held September 1 at the Indiana Memorial Union in Bloomington, Ind. Spirit of Philanthropy speakers left to right: Eric Mejia, Kristen Miller, Cassidy Clouse, Katelyn Groff, Sarah Hornak, Zachary Cornett, Seth Winstead and Nate Rose. 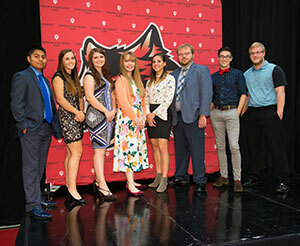 Indiana University East students welcomed community supporters to campus in appreciation of their contributions toward internships, leadership experiences and community service opportunities. Guests were invited to the Spirit of Philanthropy Luncheon held September 22 at the Student Events and Activities Center on campus. Bette Davenport, of Richmond, Indiana, knows first-hand the impact scholarships can have for students completing a degree. In recognition of Indiana University East’s mission and to encourage others to give, she is making a $25,000 gift to establish the Bette G. Davenport Alumni Scholarship. Anne Szopa was instrumental in developing the Women’s and Gender Studies and Sociology programs at Indiana University East. In recognition of her contributions and to encourage others to expand opportunities for students to study in this field, Rob and Nancy Tolley have endowed $30,000 to establish the Anne Szopa Scholarship. Greg Braxton-Brown, dean of Southeast Indiana Programs and a professor of management, will endow a $25,000 gift to Indiana University East to establish a scholarship in the name of Tim Scales, director of the Center for Entrepreneurship, director for the Center for Economic Education and senior lecturer of business administration for the School of Business and Economics. As the Indiana University community celebrates the second annual IU Day, First Bank Richmond is celebrating IU East with a $10,000 matching gift opportunity for alumni and friends of the campus.